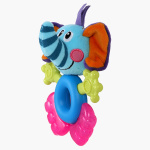 Nuby Elephant Shaped BPA-Free Teether | Multicolour | Bright color combination for development of visual sight. Keep your little one engaged during teething by giving this BPA-free teether. This high-quality teether will soothe and gently massage your baby’s sore gums while the attractive elephant shape will grab the attention of your little one. Feature 1 : Bright color combination for development of visual sight. Feature 2 : Gently massages and soothes your baby tender gums.